I am kind of brand new to this and just aquired an oceanic glass tank with cabinet and canopy used but in excellent condition. I am planning a reef tank with inverts and mushrooms fans and the lot. I just purchased a Rapids Pro PS4, mostly because it has the protein skimmer built in, auto fil, and the surface skimmer interrupts filter flow in case of power failure to prevent flooding and loss of tank water then reprimes and re-establishes water flow on power up. The tank is approximately 132 gallons, 72L x 18D x 24H. 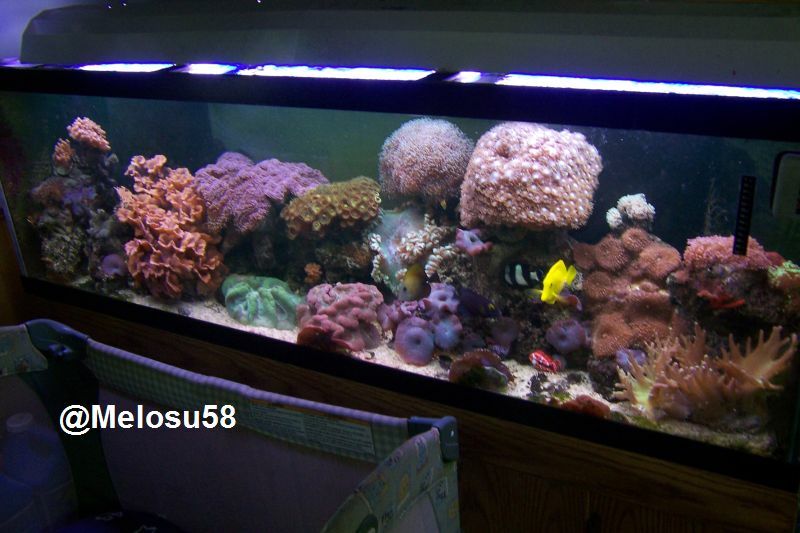 I am thinking of purchasing the following fixture for my tank. 108272" Nova Extreme Pro 12x39wattT5HO 6-10k/6-460nm actinics2Yes468w72" x 12" x 4.25"
The Nova Extreme Pro combines the best in both design and functionality, making it a great addition to any aquarium. The sleek black-aluminum construction not only maintains a low profile on the aquarium, its design also allows it to dissipate heat away from the aquarium, lamps and components. Individual polished reflectors coupled with highly efficient electronic ballasts maximize the light output and intensity of the SlimPaq T5 HO lamps. SlimPaq high output T5 lamps offer a quantum leap in lamp performance, with more than 50% higher output compared to an ordinary T5, T8 or T12 fluorescent systems, and longer lifespan. Using our proprietary blend of tri-phosphors, the high levels produce stunning color rendition and penetrating intensity. The Nova Extreme Pro includes a fan-cooled aluminum housing, independent controls for dawn/dusk applications, individually contoured reflectors for increased light output, splash lens and docking mounts. I will have to modify or replace the canopy to accept the fixture I chose but the last thing I want to do is choose the equipment for ascetic reasons and then watch my reef wither up and die on me. If anyone has any suggestions or thinks that my choice is up to the challenge I would love to hear from you. He had the best price. You dont have to have a canopy. I have VHO retro fits and they would not fit in the canopy. You can see it here.